I started off the week with dreaded running intervals. This week was shorter intervals, just 300m, but there were 10 of them, and with only 100m rest in-between. I took the decision to keep jogging in the rest stretch instead of walking like I might, maybe, do sometimes… occasionally. Despite the odd road crossing during a couple of the sprints I averaged 3:42/km which is about right given my performance in recent weeks. My legs were burning after the session which has got to be a good sign. Tuesday morning started with the other dreaded workout of the week… spin class (bike machines in the gym for the uninitiated). This week there was a guy taking it who showed no mercy. It was brutal. The area around my exercise bike looked like a salty snowman had been murdered. Not sure I’m ready for this kind of big commitment in my life. Ok, I did it. I feel terrible. But in my defence it makes sound financial sense. I’m already swimming twice a week, which is enough to cover the cost of the membership, but in March I’ll start swimming three times a week as a gear up for the Half Ironman. At lunchtime I went out in the mud and ice for an 11 kilometre saunter along the Thames. The middle 6km were at a threshold pace of 4:18/km. I was hoping for a slightly higher pace (around 4:14/km), but considering the number of icy puddles I had to dodge on the way I’m happy with that result. Another early start on Thursday morning, and getting to use my pool membership officially for the first time. I hate myself. It was a 1300m swim, but it didn’t feel as methodical as Wednesday. However, I kept the same pace so it can’t have been all bad. When I got out of the pool I discovered that I’d picked up a bike puncture on my way there. A thorn had lodged itself into the front tyre. If there’s one thing that can take the shine of a lovely morning swim, it’s repairing a puncture in -4 Celsius. It was too cold for that sort of thing. This is the point in the week where London got a few millimetres of snow and everything got a thin coating of ice. I was supposed to do a couple of bike sessions, but given the conditions were not ideal for cycling, and there was a nice warm fire a home, I opted to ‘postpone’ them. Saturday morning however was lovely blue sky and sun out for my first half-marathon distance run of 2019. It was still quite icy in patches, and very muddy along parts of the towpath, but none of that took away from the run. 21.1km along the River Brent, Osterley Park and the Grand Union Canal. Definitely worth getting out of bed for! I completed the half marathon distance in just under one hour and forty minutes. Only ten minutes to knock off to get the magical 1:30… easier said than done! On Sunday I couldn’t help but go for a bit of a cycle ride while the sun was still up. This ride had to make up for missing the two sessions on Thursday and Friday so I went hard. I completed 22km in 55 minutes. I think that counts as going hard, plus it was a beautiful way to close out the week. Only five weeks to go until The Big Half! The week got off to a less than perfect start when I fell of my bike on Monday. It was a frosty morning and there had been a water leak that had frozen over the road. I slid straight over sideways, but luckily didn’t cause myself any harm except for a nice bruise on my left side. With a new bruise to keep me company I went off for my weekly interval session. 8x 500m sprints with 200m jogs in between. I ran the splits in a 3:35/km pace, slightly faster than last week so I can’t be disappointed with that. I rounded off Monday with a 1500m swim at my childhood pool in Balham Leisure Centre. There were only two lanes – a slow and fast lane – and I’m neither. However, I attempted the fast lane and felt a bit out of place, but I wasn’t the slowest one in there so I stuck with it, just letting other swimmer’s past me when I got to the ends. On Tuesday I had booked on to a spin class at the work gym, but I ended up not being able to make it because I was too busy with meetings. Sometimes life just gets in the way. On Wednesday evening I went for a steady 12km run around south London. I couldn’t decide where to run out of the three local commons: Wandsworth Common, Clapham Common orTooting Bec Common. So I ran round all three. It’s quite tricky to find good running routes that don’t have a lot of traffic lights and busy pavements in London, but this route worked quite well. I hit a few crossings just as the red man came on, so I made up for any stops by sprinting off once the green man came on. With that tactic I managed the run with an average pace of 4:27/km (that includes the stops). Thursday started with one of life’s greatest pleasures, a morning swim. This time Balham Leisure Centre had three lanes so I could be comfortable in the medium lane again. I focused on my breathing technique and by the end of the 1200 metres I felt much more confident. My plan for the evening was to cycle the 11 miles from work to my parent’s house, but when I got to my bike I realised that my rear bike light was missing. Half of the light’s case was still clipped to the bike so I suspect that someone had knocked the light off with their handlebars by accident and broken it. So that was not ideal. To add to the situation, my front bike light battery was nearly dead making the light very dim. This wasn’t great, especially cycling along the dark Thames path. I had to cycle very slowly along the stretches with no street lights, which made it hard to get a good bike workout from the ride. I got home in just over an hour, averaging 18km/h. To make up for the lacklustre ride on Thursday, I tried to get a bit more of a workout on the bike on my way in to work on Friday. I changed the route to avoid the Thames path and stayed on the roads, which was much better overall despite having to navigate Hammersmith gyratory. I averaged 20km/h this time, which is not bad for me considering the traffic, etc. I finished off week six of the sub-1:30 half marathon plan by going all-out on a 16k (10 mile) run around Hyde Park. I chose Hyde Park as it’s the biggest of London’s parks that’s also easy to get to on the tube. I asked Kirstie if she wanted to join me and we agreed to meet at Green Park station at 9am. It was good to have that organised to hold me accountable to actually get up and go on for the run on Saturday morning. The all-out 16k was not a run I was particularly looking forward to. I needed to complete the 16k in 1 hour 8 minutes to ensure the half marathon in 1 hour 30 minutes was going to happen. That meant a 4:14/km average pace. The fastest I can run a 5k in is a 3:55/km pace, so this was going to be a serious challenge. That’s also why I chose Hyde Park — I didn’t want to contend with any road crossings or worry about where I was going. I had a banana for breakfast and then bumped into Kirstie at Stockwell station. After a 1km warm up I physicked myself up by Hyde Park Corner. The route was two laps of the perimeter of Hyde Park and Kensington Gardens, plus one lap of the Serpentine lake. I set off well, finishing the first 5km in 19:32, which is on par with my PB. I then continued to keep the pace, completing 10km in a PB time of 40:02 — one minute faster than my previous PB I set a few weeks ago. The last 4km were a killer, but I kept motivating myself by repeating “The mind gives up before the body” — at the end of the day, it is just a mind game at that point. There were lots of runners out, including a couple bigger groups, and overtaking them gave me another mental boost towards the end. I got to 16.1km in 1:05:44. A full two minutes faster than I’d aimed to. Average pace was 4:05/km. It still seems impossible to me that I managed that pace for over an hour. Just goes to show how effective the training is because there’s no way I could have done that two months ago. I was very chuffed, but also very thirsty. I rejoined Kirstie and limped back to the tube to get a cup of tea and a lot of water. This is my first official week of joint half marathon and iron-man training. For the next 8 weeks I’m going to swim twice, cycle twice and run three times every week. I started off the week with a 1100m swim at the local pool. Being January, the leisure centre are now handing out flyers for gym membership with NO JOINING FEE which, for the first time in my life, I didn’t immediately throw in the bin. Still won’t take them up on the offer, though. That evening I went for my interval session of the week. This week’s sprints were 1km long, with five in total and a 200m jog/walk in-between. I averaged a 3:40/km pace for the sprints. After work on Tuesday one of my office-mates, Barney, and I went for a 33km long cycle ride. We rode down to Richmond, then to Hampton Court before heading back North along the A312, skirting around Heathrow Airport. It was great fun. It was supposed to take an hour, but it ended up taking more like 90 minutes… Still a lot to do to improve my speed on the bike. Wednesday morning started with another 1100m swim, then I went for an 11km tempo run along the Thames at lunchtime. The south bank next to Kew Gardens is a lovely stretch to run along, even if the route back through Brentford is a bit uninspired. I was happy averaging a 4:20/km pace overall. Thursday morning I entered the gym at work for the first time in 2019 for a spin class. I learnt from last time and brought a towel with me this time, and I’m glad I did. I didn’t know I had that much sweat in me! On Friday I tried something new that will have to become a staple of my triathlon training over the next 6 months. It’s something called a Brick session, which is when you bike ride for ~45 minutes and then straight away go for a ~15 minute run. The aim of these sessions is to get used to the feeling of running after cycling. I actually found it less jarring than I thought I would, but I still think I’m not pushing enough on the bike to be completely shot for the run like I will during the iron-man. Saturday is long run day, so I set off for a 19km run around one of my old routes from marathon training last year. I always love running along the canal so this was a great end to a busy training week. I ended up running 20km at a 4:42/km pace. That ends a good week of training. Good to get some decent cycling in, although I’m realising that I need a better bike to make the most of these sessions. As for the running, I’m back up to pace after a slump over the Christmas period. The swimming is getting there, but I still need to work on a better breathing technique. This week: 4 runs. 1 ride. 1 swim. The last run of 2018 was not a torpid jaunt as its name would suggest. Instead it was my weekly interval training run, which this time consisted of three 2400m sprints with 400m jogs in-between. I managed the sprints at a 4:00/km, 4:21/km and 4:14/km pace. I was aiming for a 4:00/km, but I couldn’t manage it. I’ll put it down to a Christmas food hangover. The run was around Wandsworth Common, which was very busy with families and dog-walkers, but I still enjoyed running around where I grew up… it seems a lot smaller now than I remember. The following day, and a few drinks later, it was time for the first run of 2019. This was a gentle one with Emily and Kirstie around Tooting Bec Common this time. Another place I remember from my childhood, but unlike Wandsworth Common, now somehow seems bigger… maybe it was the hangover. On Wednesday I decided to do another long cycle ride after the successful ride to Windsor with Andy last week, this time on my own. After starting off with (another!) puncture, I headed down to the River Thames by Hampton Court Palace and then round Richmond Park. I totalled 62km in 3 hours and really enjoyed it, but it has made me realise that I need to look at getting a proper road bike. The hybrid I have is great for my commute, but it’s too heavy to get much above 30km/h. Thursday evening was when I did my next fast run. 11km with km 2,3,6,7 and 8 at threshold pace. I was really happy with how I felt on this run and all of my fast km’s were under a 4:00/km pace which is what I was aiming for. I even managed my first KOM on Strava! Many more to come I hope. Friday I had an early start and dragged myself down to the 50m pool for some lengths. I really got into it and completed 1700m before they kicked everyone out to change the lane setup. Then, after a big breakfast, I rounded off the week with a 16km long run. I ran 7km along the canal and then up and down Horsenden Hill. Horsenden Hill is a 500m, 8% uphill. It was not fun, but it did slow me down to finish the run at my target 4:50/km pace. PS This week I also signed up for the Richmond Marathon in September and the All Nations Sprint Triathlon in May. Bring on 2019! While most of the UK is curled up indoors, opening presents and eating pigs in blankets, I tried to buck the trend over the festive period and get a head start on those new years fitness goals. This week: 4 Runs. 1 Swim. 1 Ride. I have to say upfront that I suffered serious eating and drinking hangovers on a couple of the runs this week, but it’s all about getting out there regardless! And I have to say, I always feel better after a good run in the fresh air than if I’d just stayed in bed feeling sorry for myself. Monday started with some interval training – that’s several short, fast sprints followed by a slow jog to catch your breath. Today the sprints were just 400m, followed by a 200m jog. The hills of Bridgnorth presented an added sting in the tail, but not nearly as much as the spicy madras and several beers from the night before that certainly presented a handicap! I managed the first three sprints quite well, maybe because they were downhill, but then I started to suffer and had to cut short the fourth sprint because I was too knackered to keep running. I managed to compose myself again and finished the ten sprints. Looking at the table above you can see that I probably need to work on running uphill a bit more in the future. The next day was Christmas Day, which means it was time for a nice 10k loop of Bridgnorth with Emily and Helen. We followed the route of the Bridgnorth 10k which is held annually in October. It’s pretty hilly, as you can imagine, so it was pretty challenging… doubly so given that I started the run with quite possibly the biggest hangover of 2018. Then again, nothing cures a hangover like a good run, right? By the end of the run we were all ready for a glass of bubbly and the onslaught of Christmas dinner that had been wonderfully prepared for us by Emily’s mother. This is the second year we’ve done a run on Christmas day, I hope it’s a tradition that continues… although maybe not quite as far next year! On Boxing day we went for a foggy walk up the Brown Clee, the highest hill in Shropshire, with Emily’s mum providing supplies of mince pies and damson gin. The following day I went for round two at the Bridgnorth Leisure Swimming Pool, this time much busier than last Sunday, but I still managed 1250m. Friday we we’re back in West London, so I finally got a run in on flat ground! I ran 10km, with the middle 5km at threshold heart rate (AKA flat out). The threshold section was tough and I certainly felt the effects of all that festive eating and drinking. Hopefully that’ll go in a week or two of good training. Saturday was an exciting day, my workmate Andy came down and we did a long cycle ride together to Windsor and back again. It was a really varied route, taking in gravel paths, muddy fields and towpaths as well as the road. We didn’t get off to the best start as I got a big puncture within the first kilometre, but luckily Andy had come prepared with a spare inner tube and replaced the offending article in no time like a real pro. Unfortunately that wasn’t the end of our bad luck, as Andy’s chain snapped around 20km in. Thankfully we weren’t far from a bike shop where we managed to get a replacement. Once again, Andy impressed by having all the tools to hand to replace the chain in a jiffy. I learnt a thing of two watching him and have a few items on the Christmas list for next year already! Apart from all that excitement, the ride itself was lovely. 63km in total and taking six hours, two of which weren’t even spent moving! When we returned just before sunset Emily had prepared a wonderful vegan Tagine. Sunday rounded off the week with a 15km long run along a route I’ve wanted to try ever since I realised that the River Brent was a great running destination that I hadn’t tried yet. I planned a route that started with going north on the canal, then heading east through Greenford to meet the River Brent, following the river south to meet the canal at Hanwell, then following the canal back west then north to the start. I’m glad I got this route in before the end of the year, and at a 4:37/km pace I could enjoy a large fry-up for brunch with a clean conscience. Hello again, it’s been a while. I’ve run a marathon since we last spoke. It was hard, especially the last five miles when I was just trying to keep myself sane and motivated. But I made it, and in under the four hour time that I’d set myself as a target. 3h55m was my time over the line. 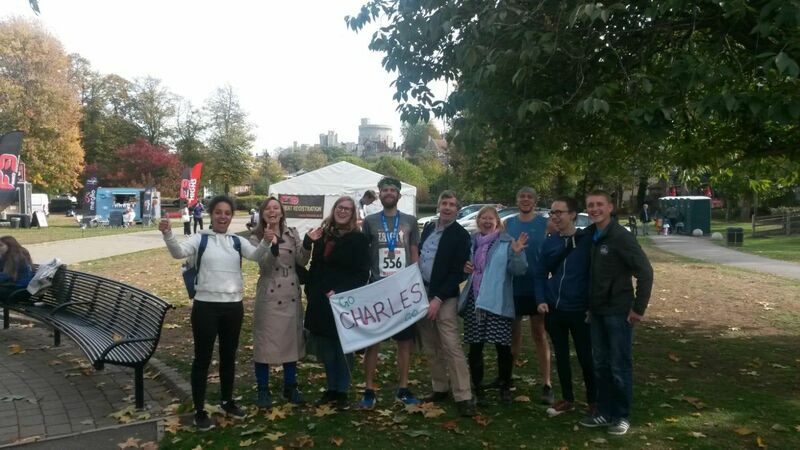 The Windsor Trail Marathon course itself was great, I love running along the river and there was lots of that, but the organisation of the day itself left an awful lot to be desired. It’s put my off any future F3 events that’s for sure. I don’t want to get into the detail here, but you can read my review of the race here along with reviews of the two other races I ran in 2018 which goes into it. Run a half marathon in under 90 minutes. My current PB is 96 minutes, but shaving those 6 minutes off is going to require a monster effort. I’m planning on attempting this at The Big Half in March 2019. Run a marathon in under three hours 30 minutes. Another big ask and one I’m currently thinking of doing at the Richmond Runfest Marathon in September 2019. Complete a Half Ironman Triathlon. As my first triathlon this might be the craziest one on this list, but nevertheless I’ve already signed up for the UK Ultimate 1/2 Triathlon in June 2019. A 1.2 mile lake swim, followed by a 56 mile cycle ride, finishing off with a half marathon run. It takes a typical triathlete around six hours to complete, so should be fun. The first challenge is to smash The Big Half in March. I started my training last week – loosely following the Runners World sub-1:30 plan – but with one less run a week. Training started on Tuesday morning with a 1000m swim at the local leisure centre, which has a brilliant 50m pool open every weekday from 7-8am. This time I’m aiming to use swimming as my cross-training. Tuesday lunchtime was my first running session, starting off with a speedwork session that nearly killed me. 5x 800m sprints with a 200m jog in between. I did this around Osterley Park but hit a bit of traffic crossing the road during the last sprint. Wednesday and Thursday I ran 8km steady in the dark December evening. Aimed for a 4:40/km pace, but on Thursday I went a bit too fast because my new watch was still set up for miles/minute which got me all confused. 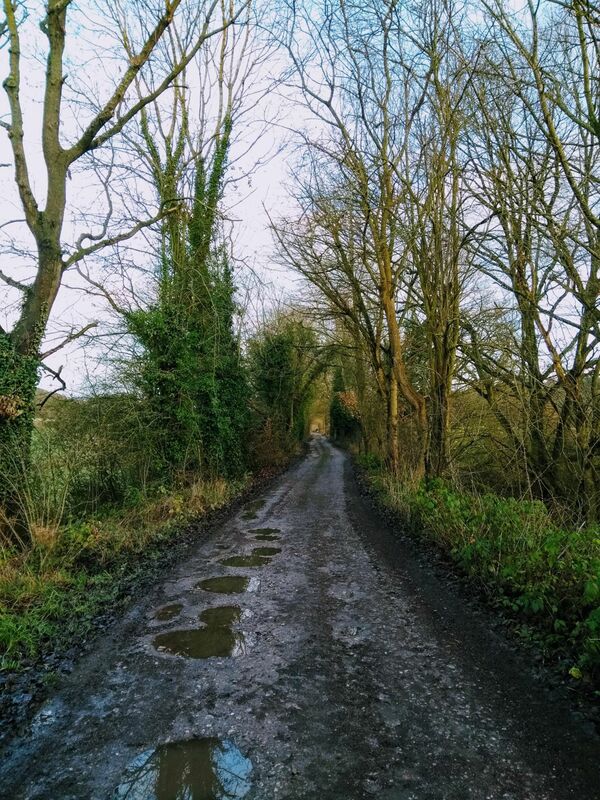 The Severn Valley Railway path that set the scene for my PB-bursting 10k – 41:34!! I finished the week’s running on Saturday in Bridgnorth by running a time-trial’d 10k along the old Severn Valley Railway route. I was aiming for a 42 minute 10k, so I was super-chuffed to manage it in 41:34. In two weeks time I have to knock another 100 seconds off that… not looking forward to that! On Sunday I wound-down with my second early-morning swim of the week, this time at Bridgnorth Leisure Centre. The centre has been recently renovated with thanks to lottery funding so the changing rooms were very clean. I was one of only three people in the pool – I guess it’s not everyone’s idea of fun at 7am the Sunday before Christmas, but it was a great start to the day!